Apple and Samsung have been battling in German courts about whether the Galaxy Tab 10.1 stole ideas from the iPad or not (among other things). So to avoid the injunction, Samsung went ahead and changed the design of the Tab in Germany so it wouldn't look like an iPad anymore. I'm not sure if this design change counts as an admission of guilt but it sure feels that way. 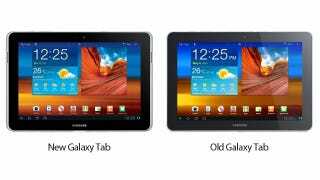 What's worse is that the new Samsung Galaxy Tab 10.1N almost looks a wee bit more iPad 1-ish after the change. As you can see in the photo above, the metal frame of the Tab wraps around the edge of the tablet now and becomes more visible. Totally different! Thing is, the iPad 1 also had a slightly visible metal frame too. HMMMM. Crap.